NEW YORK and MCLEAN, Va. – December 1, 2016 – Hilton Hotels & Resorts today celebrates its arrival in Brooklyn’s Boerum Hill with the landmark opening of Hilton Brooklyn New York. Presiding over the corner of Smith and Schermerhorn Streets, a tree-lined enclave of chic shops, trend-setting restaurants and a lively night scene, Hilton Brooklyn New York sets a new standard of hospitality in Brooklyn. The 19-story mixed-use commercial, retail and condominium development offers 196 spacious guest rooms and suites for travelers looking to experience the buzz and vibrancy that Brooklyn has to offer. Visitors and locals alike looking to experience authentic Brooklyn fare do not need to travel far as celebrated chef Rob Newton is bringing a piece of the borough into the hotel with his newest venture, Black Walnut – set to be one of the neighborhood’s hottest new gathering spots. The restaurant, his fourth in Brooklyn, will bring diners a more dynamic, versatile interpretation of Southern cuisine’s many cultures and traditions with a menu that reflects both Newton’s Arkansas roots and years of global travel. With nearby attractions including Barclays Center, Brooklyn Heights Promenade, Brooklyn Museum and Brooklyn Botanic Garden, the hotel puts guests within steps of many quintessential Brooklyn experiences. In addition, Hilton Brooklyn New York is a stone’s throw from 12 different subway lines, ready to whisk visitors to compelling Manhattan attractions. 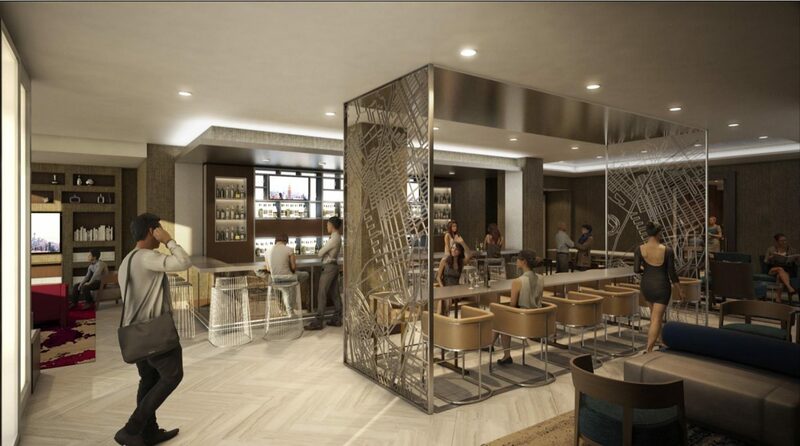 Capturing the neighborhood’s eclectic vibe, Hilton Brooklyn New York’s design aesthetic includes a rope motif that pays tribute to the Schermerhorn rope factory that previously occupied the site in the 19th century, braiding rope for New York’s shipbuilding industry. Guests will find references to the site’s history throughout the new-build hotel’s stylish interiors, which are the work of architecture and interior design firm Stonehill & Taylor. Among these references are carpeting patterned with rope imagery running the full length of corridors, and murals of vintage neighborhood maps lining the walls. With 2,300 square feet of dedicated function space, Hilton Brooklyn New York can accommodate up to 140 attendees for meetings and social events. For business and leisure travelers who want access to services and facilities on their own schedule, the hotel’s round-the-clock amenities include a 24-hour fitness center, a business center, grab-and-go pantry and concierge service. Hilton Brooklyn New York participates in Hilton HHonors®, the award-winning guest-loyalty program for Hilton. To mark the hotel’s opening, Hilton HHonors members who stay at the hotel through May 29, 2017 will earn 1,000 Bonus Points per night along with instant benefits, including an exclusive member discount that can’t be found anywhere else, free standard Wi-Fi and digital check-in. Hilton Brooklyn New York is owned by Flank and managed by Urgo Hotels & Resorts. It is located at 140 Schermerhorn St., Brooklyn, New York 11201. For more information or to make reservations, please visit brooklynnewyork.hilton.com or call +1 718 834 8800. Media may learn more about the hotel and download high-resolution images at news.hilton.com/brooklyn. More information on recent and upcoming Hilton Hotels & Resorts openings is available at news.hilton.com/openings. To view an interactive map featuring the Hilton Hotels & Resorts development pipeline, visit news.hilton.com/map. Urgo Hotels is a Bethesda, Maryland-based hotel company that develops, owns and/or operates 34 distinctive and unique hotels and resorts with an aggregate of more than 4,900 rooms in major markets and resorts in the United States, Canada and the Caribbean. The company develops, builds and operates for its own account, and provides third-party management and asset management services. For more information about Urgo Hotels & Resorts, please visit www.urgohotels.com. Stonehill & Taylor is a hospitality-focused architecture and interior design firm, based in New York City. For each project, the firm seeks out the essence of the location and the client’s vision to create an inspired approach. The firm’s high-profile portfolio ranges from interior design and renovation, to new building construction, adaptive reuse and historic preservation projects, including: Ace Hotel New York, The St. Regis New York, The Camby Hotel, The Asbury Hotel, InterContinental Barclay, The Bryant, The Whitby, and Paramount Hotel’s Diamond Horseshoe. Stonehill & Taylor is at the forefront of innovative and award-winning sustainable design, developing projects like The Crosby Street Hotel, The NoMad Hotel, and Portland’s Press Hotel that are conscious of their impact on local communities and the world. For more information, please visit: www.stonehilltaylor.com.